Some people are curious of why they are getting a 25 cent discount on their Muni rides when using their Clipper card. Some say it's a glitch, while others thinks it's an exploit. To tell you the truth, it's neither. It's all about automatic discounts with the Clipper card. For the longest time, transit agencies have inter-agency agreements and this means for qualifying customers meeting certain criteria, they can either get a free transit ride on another agency, a local fare credit, or a discount. With the Clipper card in place, inter-agency transfers are even easier as you don't need to get a paper transfer from a machine and you always get the best discount available. The current agencies operating under Clipper (Muni, BART, AC Transit, Caltrain, Golden Gate Transit & Ferry, Samtrans, and coming soon, VTA) all have inter-agency agreements with one or multiple agencies. This blog entry will explain how the agreements work. Remember the general rules: You must use the same Clipper card to get the benefits, and if you have a pass on your Clipper card for the transferring agency, it overrides the discount. Reminder: VTA won't be accepting Clipper until February 16th. When exiting BART within San Francisco, board any Muni vehicle or enter the metro within one hour, and receive a 25 cent discount on your ride. A Muni pass overrides this discount. Once you activate your $1.75 discount going away from BART, you are entitled to a 25 cent discount within 24 hours on your return trip to BART. Interestingly, since Clipper readers on Muni doesn't know what line or direction it is operating, even if you ride a different bus within 24 hours and it doesn't go to BART or you exit before you reach the BART station, you still get the 25 cent discount. If you have ever read your Clipper history report online, it doesn't mention which Muni line you rode (it says "MTA NONE") while taking BART or Caltrain will say what station you entered and exited. For passengers exiting at Daly City station, they are entitled to a free Muni ride on the 54, 28, or 28L away from the station. The Clipper card will be encoded upon exiting BART and transferring to the Muni bus will not deduct the e-cash purse, but will give the OK to enter as the ride is free as long as you board the bus within one hour. The return trip to Daly City BART is free on the 28 and 54, as long as you use it within 24 hours. But... once again, the system is a little bit dumb. Muni Clipper readers don't know what line it is, so if you take another bus on your way to somewhere, your next ride is also free. It doesn't matter if you ride 28 or 54 back to BART, Clipper takes advantage of the best deal available for the passenger. Upon exiting the SF Golden Gate Ferry terminal, you get 50 cents off to take Muni within one hour. When returning on Muni to Golden Gate Ferry, you get 50 cents off your Muni fare back to Golden Gate Ferry within 24 hours of your initial exit from Golden Gate Ferry. Updates: Just take Muni and transfer to Golden Gate Ferry and receive a 50 cent discount on the ferry ride. When riding Golden Gate Ferry, transfer to Muni and get a 50 cent discount on the Muni ride. There is no more 24-hour policy. When transferring from a Muni vehicle to Golden Gate Transit, the passenger receives a 50 cent discount on their Golden Gate Transit fare. When transferring from Golden Gate Transit to Muni, the passenger receives a 50 cent discount on their Muni fare. Caltrain monthly pass users must have at least two zones on their Clipper card to use the inter-agency benefit. When riding Samtrans, tagging the card gives a local fare credit (on almost all routes, it's a free ride). When riding VTA, it is free rides on all local and light rail routes. When riding an express bus, it is a $2 discount (for adults, an express ride will deduct only $2 from your e-cash fund). For those with VTA monthly passes wanting a local fare credit for Samtrans, you need to board VTA first to activate the discount, and when transferring to Samtrans in Palo Alto, tag the card on the Samtrans bus to receive the discount. The procedures are reversed for those with Samtrans monthly passes to get a local fare credit for VTA. To get the local fare credit for the transferring agency, you need to do it within two hours of boarding your "home" agency. The transferring must be done within the confines of Palo Alto (e.g. the transit center). AC Transit and Dumbarton Express passengers transferring to VTA receives a local fare credit within two hours of boarding an AC Transit/Dumbarton vehicle. BART passengers transferring to VTA at Fremont station receives a $2 discount upon boarding VTA within one hour. Your e-cash purse will deduct $2 instead of the full $4 fare. There is no discount for returning on VTA to AC Transit, Dumbarton, and BART. Discount only valid when exiting the other agencies and boarding VTA. Upon exiting BART and boarding an AC Transit bus within one hour, you receive a 25 cent discount off your e-cash fare for AC Transit local buses. When returning on a local AC Transit bus to BART within 24 hours of exiting BART, you get a 25 cents off your AC Transit ride. While not exactly an inter-agency transfer agreement, monthly Caltrain pass users can also purchase the Muni monthly pass add-on for a discounted price of $55. This does not include BART rides in SF and Cable Cars. The Samtrans website about Clipper does not mention about the $55 Muni pass that can be purchased when purchasing a monthly Samtrans pass. For now, you can still buy the paper Samtrans pass and pay the extra $55 fee for the Muni sticker. The Golden Gate Transit website does not mention if a Clipper e-transfer is applicable. They explicitly only mention paper transfers. Can a GGT and/or AC Transit representative clarify this? This won't be active on Clipper for a long time until they get the other smaller agencies like WestCat to join the Clipper consortium. I believe I covered all inter-agency transfers with agencies that are participating in the Clipper card program. If I missed one, leave me a comment. If you attempt to use an inter-agency benefit and for some reason it didn't work, I suggest contacting Clipper customer service to get it resolved as soon as possible. There is something annoying about the Muni/BART integration. If you board Muni, then BART, then Muni again within 90 minutes, the second Muni boarding will not count as a transfer, and you will be charged anew, albeit with a 25c discount. I've heard about that issue before that your Muni 90 minute transfer gets wiped off when you ride BART and back on Muni again. Only solution is to have a second Clipper card so you can maintain your transfer ability. Just a correction on the SamTrans to VTA transfer. With the activation of Clipper on VTA, transfers between SamTrans and VTA are now no longer geographically limited. As long as the SamTrans or VTA customer boards the other transit system within 2 hours of boarding their "home" agency, they will receive the local fare credit regardless of where they are transferring. How about VTA(San Jose) to Bart (Fremont) i didn't see it on your list. VTA only accepts the discount when leaving Fremont BART. There's no discount for the return trip, unless if you use a BART plus ticket, which is not part of Clipper at this time. "When returning on Muni to Golden Gate Ferry, you get 50 cents off your Muni fare back to Golden Gate Ferry within 24 hours of your initial exit from Golden Gate Ferry." How do they know you are transferring from muni to GGF, in this example, if Clipper doesn't know what Muni you used to get there? I'm assuming, you would just have to transfer from Muni to GGF with in an hour of tagging on at Muni, like when you go from GGF to Muni. Assuming this is with the 24 hour period of initial GGF exit. If that is the case, then the use of "retuning" is a bit confusing. Good question. 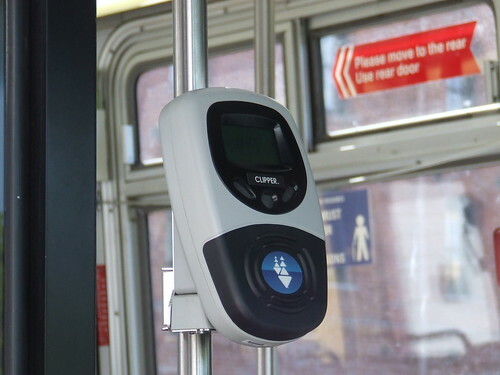 Since Clipper doesn't require Muni to input which direction and route they are operating into each reader, the system has to automatically assume the passenger is returning to GGF; even if the person doesn't go back within the 24 hour window. Caltrain Monthly Pass Users - Ready for Clipper? Caltrain's Website Referring to My Blog?